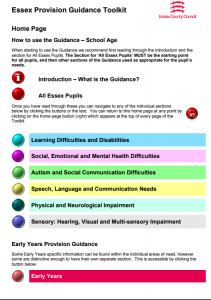 The Essex Provision Guidance toolkit is an interactive PDF. Click the link below to open the PDF in your browser or right-click and select ‘Save as’ to download it. When starting to use the Guidance we recommend first reading through the introduction and the section for All Essex Pupils. The Section for ‘All Essex Pupils’ MUST be the starting point for all pupils, and then other sections of the Guidance used as appropriate for the pupil’s needs.